Editor's note: We've got an updated eBook on the topics covered in this blog series: Web API Design: The Missing Link. In previous discussions about pragmatic REST API design, I talked about simplyfing associations, using the HTTP ? to hide complexities and optional parameters, choosing plural nouns and concrete names, and more. What about errors in the context of RESTful API best practices? Many software developers, including myself, don't always like to think about exceptions and error handling but it is a very important piece of the puzzle for any software developer, and especially for API designers. Why is good error design especially important for API designers? Bottom line, it's about making your APIs intuitive and making developers successful. First, developers learn to write code through errors. The "test-first" concepts of the extreme programming model and the more recent "test driven development" models represent a body of best practices that have evolved because this is such an important and natural way for developers to work. Secondly, in addition to when they're developing their applications, developers depend on well-designed errors at the critical times when they are troubleshooting and resolving issues after the applications they've built using your APIs are in the hands of their users. 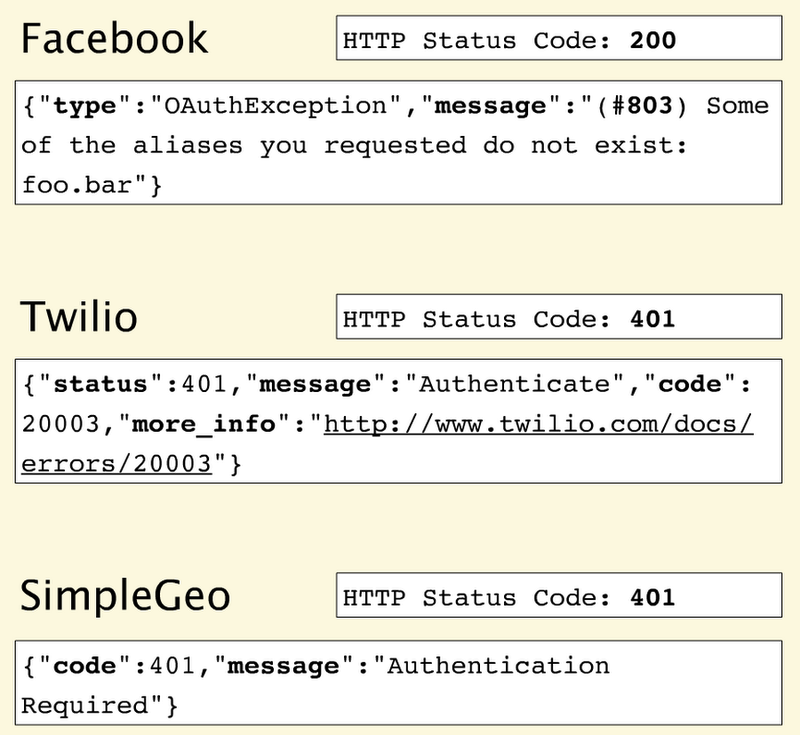 Let's take a look at how three top APIs approach it. Therefore, most API providers use a small subset. 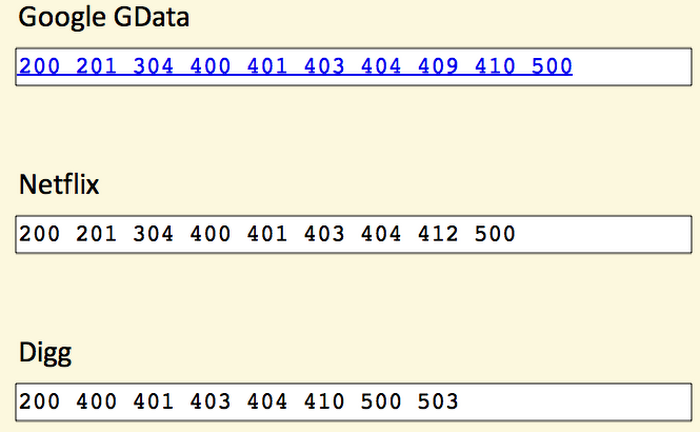 For example, the Google GData API uses only 10 status codes, Netflix uses 9, and Digg, only 8. It is important that the code that is returned can be consumed and acted upon by the application's business logic - for example, in an if-then-else, or a case statement. 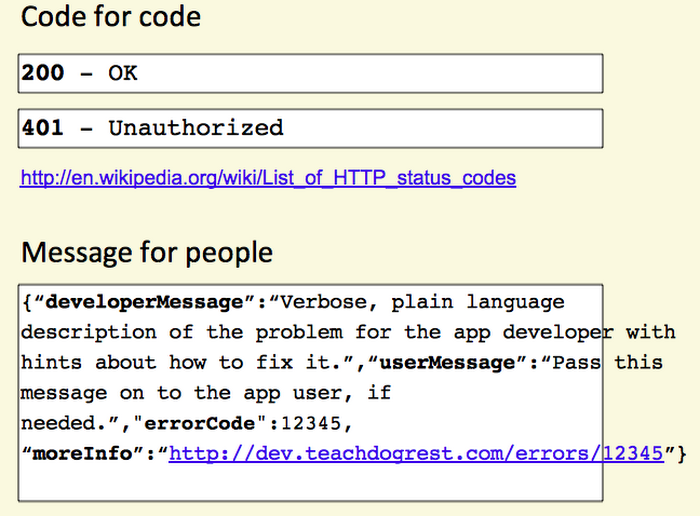 Add as many hints as your API team can think of about what's causing an error. I highly recommend you add a link in your description to more information, like Twilio does.